I will be honest, we actually won a free book from Dog Tipper months ago but I was super busy and forgot about it until our promo code wasn’t valid anymore. 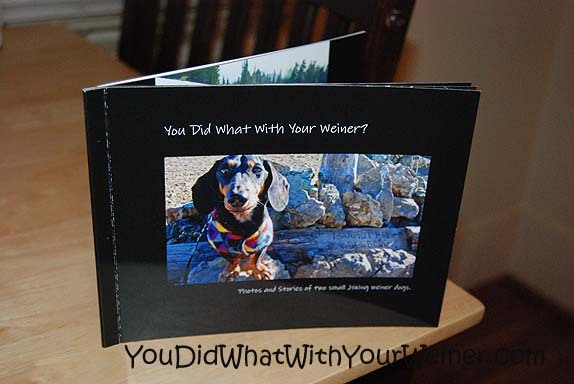 Since I am planning to make some kind of You Did What With Your Weiner? coffee table photo book next year I decided to order one on my own. I wanted to do a test order to see what our photos would look like in a book and what the print quality was like. It did take me a few minutes to scan my options and figure out how to work their software but then I literally threw something together in about 15 mintues. I went with the least expensive book, the 20 page, 5X7 soft photo cover, and chose the Simple Design Path (note: you get the same book options whether you choose the Simple or Custom design path). Creating the layout of the book was simple. I didn’t even attempt to use any of my creative juice because 1) My reserve is low and 2) this was primarily a test to see how the photos would look. I chose black borders and used three different page layouts – photo portrait, photo landscape, and one test page. I noticed when I was randomly inserting my 13 photos that the program crops the images for you. I didn’t like that at all because it ended up cutting out some of the most important details of the photos – like the mountains and scenery we love. Maybe you can crop them yourself or scale them to fit but I wasn’t able to find how to do that in the, oh, one minute I took to look…so if it is possible, the way to do it is not obvious. For the text, I was more concerned with the overall look and the layout so I just threw in a quick blurb on each text page. You can choose from about 25 different fonts and change the font size when you enter text. Depending on the background, you may also be able to change the color of the text. My only option, I am assuming due to the black background, was white but I think that looked very cool and modern anyway. I was very eagerly awaiting the book so delivery seemed to take for-evar. It really only took 7 business days to get here though. I might of liked it sooner but, considering printing time, that timeframe seemed very reasonable. When the book arrived it was a little thinner than I expected. However, the binding was better than I thought, the print quality was probably as good as it would get for the quality of the photos I gave them and the photos looked very snazzy against the simple black background. I really liked the book. The only thing I would have done different is made the text bigger. I didn’t pay much attention to the size (because it appears smaller than it actually is when viewing the book in their creator anyway) but the text was kind of hard to read. Looking back, I see that the main text was 9 pt so that makes sense. Next time I would definitely make it at least 11 or 12 pt. I would also increase the size of the font of the page titles to make sure the text to title proportions stayed similar. Next time I would go with a hard cover book. Even after opening the soft cover book once I could start to see a white line on the front page where the crease of the binding was. 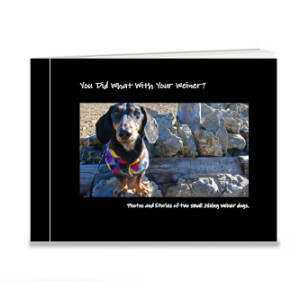 I know there are other options out there for photo books but I was happy with the ease and quality of the Shutterfly books. I will make the few changes mentioned above and order from them again. 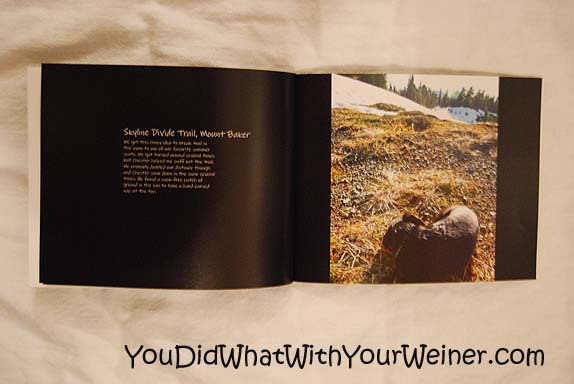 I AM unhappy about the automatic photo cropping so if someone knows how to fix that or knows where you can design a book that doesn’t do that I am all ears. This looks cute! I’ll have to have my mommy make me one! Love your book – it’s always fun to do lots of things with the photos!! My Mum does stuff like that too – she uses iPhoto and within that you can order books, calendars, etc and they’ve always been good – plus you can crop the photos just how you want – but it’s for Mac users – not sure if you’re Mac or Windows? The book looks very nice. I always have trouble with the text size whenever I do these kinds of things online. The computer screen never seems to match the product. Yeah, I think I will still make a test “real book” before I go ahead and order multiples to make sure I have the font the right size. You guys look great in that book! Great idea. We love Shutterfly! Thanks! Even though I threw it together in 15 minutes I was rather pleased with the results. The real book is going to be even more awesome. Ive been playing with ArtsCow.com making wall calendars that we are giving away on the blog on Fridays. The print quality is good but the automatic cropping is a total pain! I put our logo on each photo and they were all getting cut off. I was able to go into their forum and found the optimal photo size and then cropped them myself before uploading. That worked much better, but it might be tougher for a picture book if you’re using several different page layouts. Thanks for the tip! It sounds like the cropping issue is a common one so I will probably stick with Shutterfly. I will look and see if they list an optimal photo size and see if I can take care of that before I create the book. The scenery in our photos is just as important as Chester and Gretel so it really irritates me to have it cut off. I don’t know about the cropping problem — or anything else technical — but from a book browser perspective it looks terrifically professional. I’ve used Shutterfly for our photo Christmas cards and been really happy with how they turned out. The cropping wasn’t a problem for those. I’ve never ordered photo books from them, but I have ordered photo books from Mixbook and been very happy with them! The cropping issue was minor but I am very picky. Ha, ha. I have never heard of Mixbook. I will check them out. Fun idea. I like those instant book products you can order now. Someone gave us one for our wedding and it was fun to put together. I was impressed even with my first shoddy attempt. I only imagine what I could do with a little effort. Ha, ha. THOUGHT YOU MIGHT LIKE OUR BLOG FROM TODAY BECAUSE IT IS ALL ABOUT HIKING! GREAT NORTHERN: THE BEST HIKE IN MONTANA! I’M A LOT BIGGER THAN YOU…SO IT’S NOT SO IMPRESSIVE, BUT YOU MAY LIKE THE DETAILS. RUFF! We are going to go for a nicer book next time and see what happens. Until I read this, I didn’t know how easy it is to make a photo book. I thank you for writing about this and posting the photographs too. I had put it off for a long time too thinking it would be hard. Actually, I did look once before on another site but it seemed overwhelming. Once I took a minute to orient myself with Shutterfly it was pretty simple. i am definitely going to make another one. I left you a comment, then it disappeared. Could it be waiting moderation?